“The Buddha then said to Elder Sariputra: ‘If you travel westward from here, passing a hundred thousand kotis of Buddha-lands, you will come to the land called Utmost Bliss, where there is a Buddha named Amitayus. He is living there now, teaching the Dharma’”. The Infinite (Unlimited) Light of Amida is a transcendent (Sambhogakaya) manifestation capable to go anywhere in the universe. This is why He said that if His “light should be limited “ then He will not attain Buddhahood. This Light embraces, protects and brings the wisdom of faith (shinjin) into the hearts and minds of people who are open to His message of salvation. Through His Light, Amida tries permanently to influence beings and make them accept His salvation contained in the Primal Vow (18th). It is like an immense magnet attracting all beings to Him. 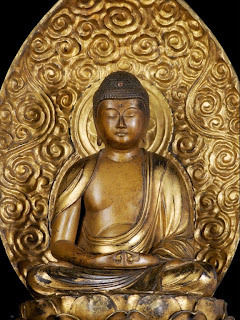 Some become opened to it sooner, while others will do so in the future, but Amida will continue sending it until all hells are empty and all beings will become Buddhas. The Infinite (Unlimited) Life of Amida simply means that His transcendent (Sambhogakaya) manifestation will last forever for the benefit of all beings. This is why He said that if His “life-span should be limited”, then He will not attain Buddhahood. Thus, the Sambhogakaya aspect of Amida Buddha has a beginning, when He attained Buddhahood, and no end (no limit), because He is the Buddha of Infinite (Unlimited) Life. “His (Amida’s) body is as glorious as a thousand million kotis of nuggets of gold from the Jambu River of the Yama Heaven and that His height is six hundred thousand kotis of nayutas of yojanas multiplied by the number of the sands of the Ganges River”. Sutra on Visualisation of the Buddha of Infinite Life [Contemplation Sutra], namely the ‘Buddha in the contemplation on the True Body’”. the number of the sands of the Ganges." 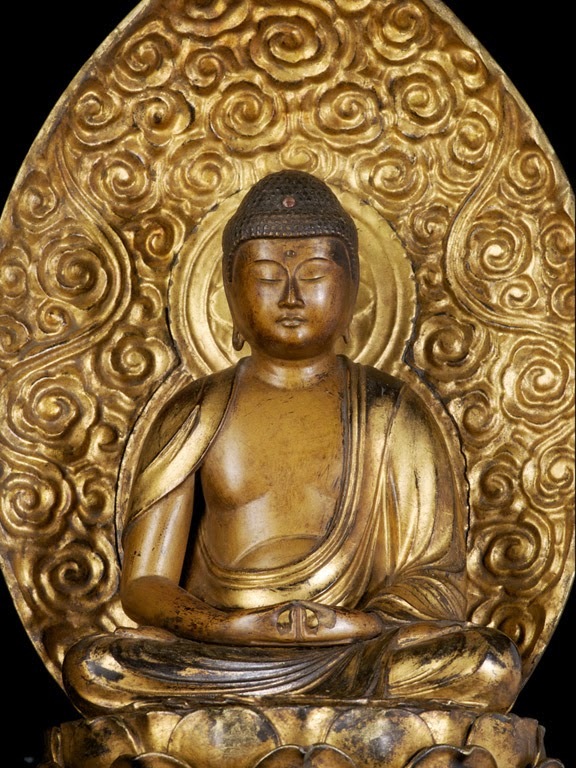 In the same section with the 9th contemplation, the aureole of Amida Buddha is said to contain many “transformed Buddhas numbering as many as a million kotis of nayutas multiplied by the number of the sands of the Ganges River”. In the conclusion of this presentation of Trikaya doctrine, we can say that Amida Buddha is beyond any form in His Dharmakaya aspect, dwells with His transcendent form (Sambhogakaya) in the Pure Land, and in the same time He is here with us, people who have genuine faith in Him, in His various Accomodated and Transformation Bodies (Nirmanakayas). Wherever we are, in our room, on the street, alone or with friends and family, etc, Amida Buddha is always accompanying us. When we ourselves will attain Buddhahood in the Pure Land, we’ll have access to the ultimate reality beyond forms (Dharmakaya), we’ll dwell forever in transcendent form (Sambhogakaya) in Amida’s Pure Land, and in the same time we’ll go in all the places of the universe in various Bodies of Accomodation or Transformation (Nirmanakayas) to save all beings. The Three Pure Land Sutras - A Study and Translation from Chinese by Hisao Inagaki in collaboration with Harold Stewart, Bukkyo Dendo Kyokai and Numata Center for Buddhist Translation and Research, Kyoto, 2003, p.23-24. The Three Pure Land Sutras - A Study and Translation from Chinese by Hisao Inagaki in collaboration with Harold Stewart, Bukkyo Dendo Kyokai and Numata Center for Buddhist Translation and Research, Kyoto, 2003, p.103. The Three Pure Land Sutras - A Study and Translation from Chinese by Hisao Inagaki in collaboration with Harold Stewart, Bukkyo Dendo Kyokai and Numata Center for Buddhist Translation and Research, Kyoto, 2003, p.104-105. The Buddha’s life indeed has no measure. Shining on the blind and ignorant of the world; hence, I bow in homage”. Shinran Shonin, Kyogyoshinsho, cf with Kyogyoshinsho – On Teaching, Practice, Faith, and Enlightenment, translated by Hisao Inagaki, Numata Center for Buddhist Translation and Research, Kyoto, 2003, p. 233. and Kygyoshinsho, Ryukoku Translation Series, Ryukoku University, Kyoto, 1966, p. 161. Shoshinge. The Way of Nembutsu-Faith: A Commentary on the Shoshinge, by Hisao Inagaki, Nagata Bunshodo, Kyoto, 1996.